It’s a franchise heavily embedded in our culture. Being parodied too many times to count and penetrating the usual commercial endeavors (I.E. toys, costumes, posters, soundtrack collections, multiple DVD/Blu Box Sets, and etc) including a game. A terrible game. Alas, the public would have to wait 28 years to find out how awesome such a prospect would actually be. And two of these games (Friday the 13th and Last Year) are successful Kickstarter projects. 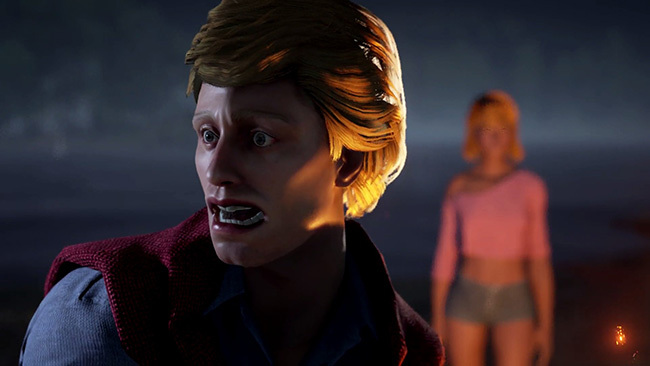 All three games allow players to pick a Slasher movie villain and kill the innocent in asymmetric multiplayer (one player as the killer versus other players as the intended hapless). Dead by Daylight had the advantage of being the first among these kind of games to be released. Yet it has been criticized for having poor balance and not providing a good experience for first-time players or those not exclusively playing with friends. Now arrives Friday the 13th The Game. A game that was in development for over two years and sought the talents of Kane Hodder, Harry Manfredini, and Thom Mathews for involvement in the game’s conception. The big question on everyone’s mind is this: is this what we wanted? 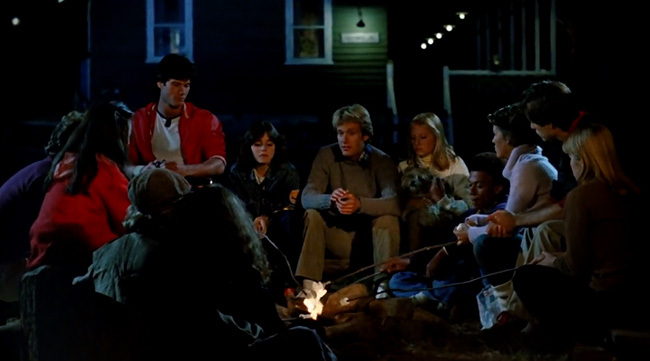 Friday the 13th The Game is set between 1979 and 1984 and allows up to seven players to play as camp counselors and try surviving against one player as Jason Voorhees for a total of 8 players per match. Nearly all varieties of counselors and Jason designs from the movies are available. Play as a variation of Shelly from Part 3 (in 3D!) or the girl in short shorts from part 2. Not to mention 7 different Jason variations from the film’s Part 2, Part 3, Part 6: Jason Lives, Part 7: the New Blood, Part 8: Jason Takes Manhattan, Jason Goes to Hell, and a design exclusive to this game designed by Tom Savini himself (more on that later). There are three maps and they are heavily based on the locations seen in the first 3 movies. Avoid Jason for all of 15 minutes. Call the police. This requires players to find a fuse, and then find a fuse box to repair, then find a phone, then wait 5 minutes, and then try to make a break for them. Locate a car and drive out of the camp. This requires players to find a car battery, find a can of gasoline and then find car keys. Jason has the ability to temporarily halt the car if you run into him. Plus there may be two kinds of cars on a map (sometimes there’s only one car). One car can hold 4 passengers while the other can hold only 2. Locate a boat. This entails finding a propeller and gasoline. However, this is easily the worst option against certain Jason varieties. Specifically parts 6, 7, and 8. As reflected in the movies these Jason varieties are incredibly fast in the water. 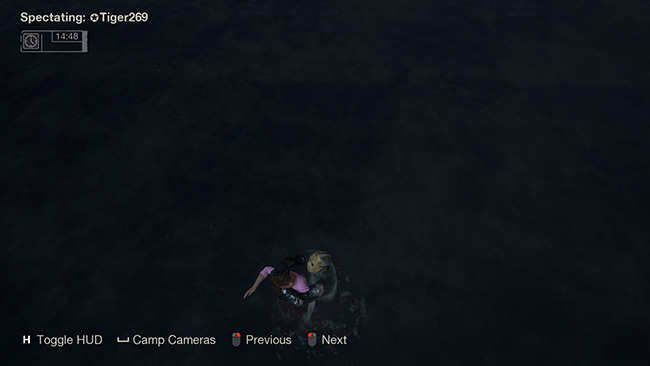 So using the boat in that situation is a death sentence for the Counselors not unless the player using Jason is distracted or not very good at using Jason. Killing Jason. This is easily the most complicated way to win. 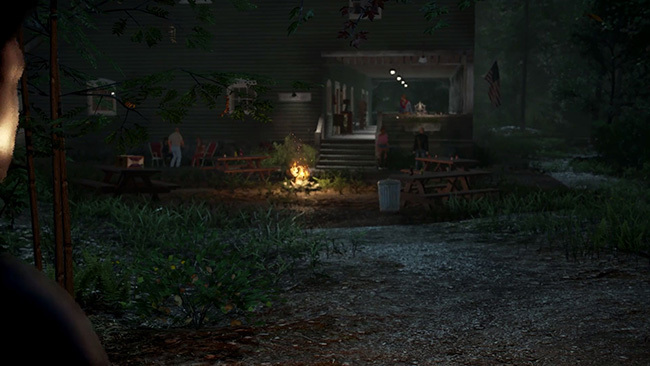 Counselors also have the ability to arm themselves with flare guns, shotguns (with one shell loaded), melee weapons, place bear traps, and turn on radios for a distraction. Playing as Jason is a little different. Jason has the ability to teleport around the map. He also a “Sense” that makes it easier to detect Counselors (think of it like the infrared vision modes employed by the Predator). And a “Stalk” ability that masks Jason from the detection of Counselors. The Stalk ability has limited uses. He also has two teleport abilities that make it infinitely less frustrating to catch up to the more agile players. Some purists have complained about the ability, saying that only part 8 Jason should have it. But if all Jason Variants couldn’t teleport then the game would be almost impossibly hard for the player using Jason. “Morph” allows you to instantly teleport to any part of the map but it’s not incredibly precise. If you want to teleport in the middle of a road then you will actually teleport to the side of the road. “Shift” is similar to Morph but allows you to travel incredibly quickly in a POV perspective similar to the evil unseen force from the Evil Dead franchise. If you have a headset on you can also talk to your potential victims and listen in on their conversation. This feature just adds to the fun and adds another layer of strategy. As Jason, you obviously have the ability to kill Counselors in a variety of gory ways. The gameplay takes a little getting used to and is context-sensitive. Sometimes you mean to open a door and accidentally grab an item near a door. This is made more frustrating during intense moments. Would it have killed the developers to add two different buttons for context-sensitive items so you don’t accidentally do the wrong thing? Why does that looks so familiar? All varieties of Jason look very good and obviously a lot of time and love went into designing these models. The gore is mostly great. A couple of kills don’t look as impressive as imagined but those are roughly 3-4 out of the over 30 unique death animations available. Doing any action feels delayed. The instant you want to close a door, take out a gun or swing your weapon takes about a second to register. It doesn’t help that the game runs at a minimum of 45 FPS instead of 60 on recommended equipment. I am unable to determine what FPS the game runs on console but running at a minimum of 45 FPS is a bizarre design choice. On my computer with V-Sync off I get an FPS anywhere between 41-77 with settings set between low and medium. 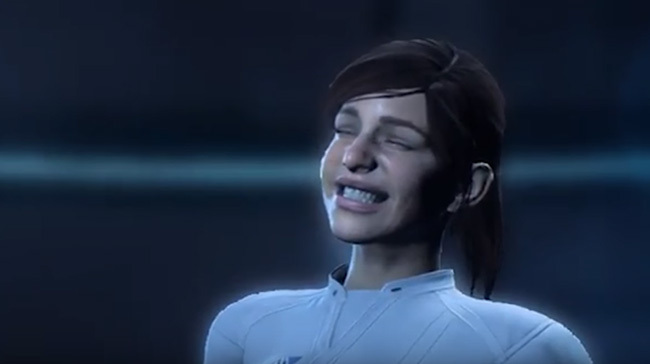 To be fair, the game doesn’t run too badly at 45FPS and is in anything but slow-mo. With V-Sync off I haven’t noticed much in the way of screen tearing. The delay is just something you have to get used to. Unfortunately, this interferes with the melee combat. Using melee weapons against Jason is generally a really bad idea no matter what kind of weapon you find. The delay in using these weapons is probably intentionally designed that way to give Jason an advantage. That makes sense for anyone who has seen the movies. 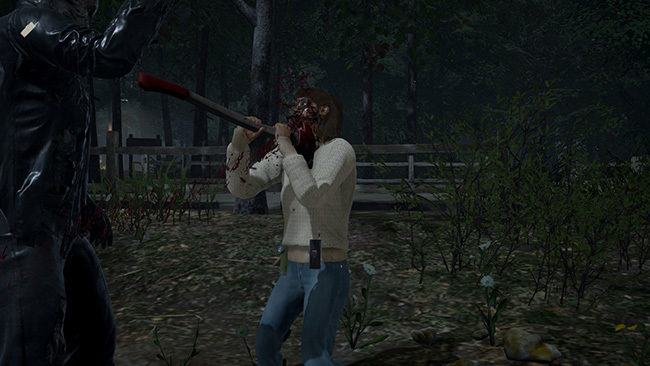 Melee weapons are a last resort for your Counselors no matter what stats they have. It’s an infinitely better idea to use a ranged weapon or firecrackers in order to stun Jason. Counselors can equip up to 3 items which range from fuses, first aid spray (ala Resident Evil), a pocket knife, firecrackers, and car keys. 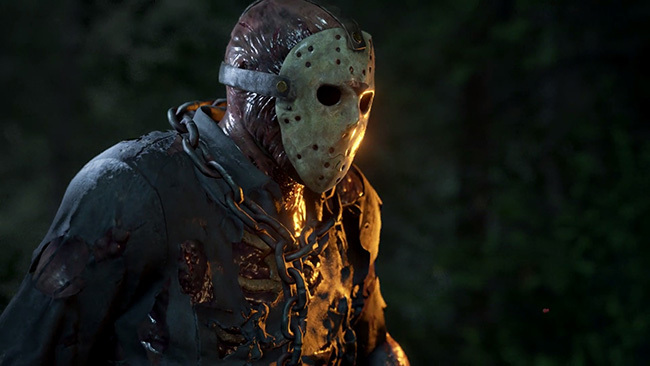 Jason is able to equip throwing knives (echoing Part 6: Jason Lives) and starts out with a set limit of bear traps (oddly, echoing the Friday the 13th Remake and Dead by Daylight) whose’ number depends on which type of Jason you pick. But is the game good? Kind of. Friendly Fire is on no matter what. This is one of the big head-scratchers for me. Why on earth the developers decided to leave Friendly Fire on is baffling. The problem is very annoying and didn’t need to be in the game. It’s very easy to hit a fellow Counselor with the Shotgun when you’re aiming for Jason who has just grappled someone. If two or more Counselors are using melee weapons on Jason it is very easy to hit other Counselors. Not to mention that this leaves the door wide open for trolling or Counselors to work out a deal with the player controlling Jason. If a Counselor kills another Counselor they lose 200 points which isn’t much considering that you get 500 points just for completing a match. The developers didn’t think too far ahead because once someone reaches level 31 to unlock all Jason varieties the incentive to not team-kill goes away. There’s also no vote-kick option. Yes, really. There’s no region filtering. So expect to find rooms with people at 300 ping during non-peak hours. There are plenty of visual hiccups too. Sometimes Jason will perform his fatality and the ragdoll will go flying into the sky. Sometimes Jason and his victim will clip through the environment. Not to mention times where players cannot use weapons because of bugs. I’ve personally had it happen where I tried to take out a shotgun and the game just completely ignored the input. To be fair, that happened only once. It’s going to take a long time to unlock every Jason variation. I’ve put over 20 hours into the game so far and have only just now unlocked Part 8 Jason. And then there’s the inevitable boredom. For the player hiding from Jason, slowly making their way through the map and trying to survive. It is incredibly intense and especially when Harry Manfredini’s score kicks into overdrive. But for the player’s spectating all of this it’s not so exciting. The developer’s mea-culpa to players who have died early is the chance that they can come back as Tommy Jarvis (provided that the radio summoning Tommy has been used) armed with a map, walkie talkie, and shotgun to potentially save the day. There might be some slight balancing issues between the Counselors and Jason variations. If you pick a male Counselor there is no way you can use Pamela Voorhees’ sweater. Plus many of the female characters have stamina and repair abilities similar to the males. Two male characters might be the strongest but it doesn’t matter too much considering how wonky melee combat is. A good player using the Vanessa Jones character can easily frustrate a Jason and even moreso a player using a slower Jason variant. It’s overall more beneficial to pick a female Counselor which also makes sense if you’ve seen the movies. It’s hard to tell if the developers intentionally designed it that way or not. When it comes to your selection of Jason variants, some have really clear advantages over others. Parts 2 and 3 Jason can run (or jog really) but have certain disadvantages relating to their stun resistance. I would recommend Parts 2 and 3 Jason to anyone new to the game. The other variants have a steeper learning curve. With Part 6: Jason Lives, you have to get good at using the throwing knives. Part 6 also has the longest reaching weapon and can easily hit Counselors through a window. It’s also easier to hit a single window with his spear (no doubt a hit-detection issue that should get patched). Part 7 Jason could be the worst one in my humble opinion. He’s slow, can’t break down doors any quicker, can get stunned just like the others, doesn’t have range on his weapon, and starts out with only two bear traps. It’s sad because New Blood Jason is the only Jason that has the machete. How that happened is anyone’s guess but there are rumors that you may be able to select different weapons with Jason in a future update. Part 8: Jason Takes Manhattan could be one of the best overall Jason’s just because he can break down doors very easily (he can break down a barricaded door in three hits as opposed to six) and suffers no penalties regarding his teleportation abilities. Plus he has an average number of bear traps. I have yet to unlock the Jason Goes to Hell variant and did not pre-order to get the Tom Savini Jason. Jason is deliberately overpowered. You are going to die. It’s expected. The game is designed in such a way that Jason is going to kill at least half of the players. It doesn’t try to be fair and give every single player a chance because doing so would diminish the threat of Jason. Sometimes it’s about luck and finding good items. Sometimes it’s about good team work. There’s no guarantee that you’re going to survive the match. The insane thing about all of this is that despite these issues the game is still fun. No two matches are the same no matter if you’re playing with friends or not. The tension is palpable and the whole thing is clearly a love letter to the franchise. In some ways this reminds me of Alien Isolation which was also a fantastic game, a love letter to a franchise, and that also had its fair share of glitches and minor flaws. Playing as Jason and murdering people is extremely fun. Make no mistake but this is the game I wanted back when I was nine-years-old. It’s just a shame that it has all of these issues on launch. Even moreso considering this was in closed beta for over 6 months before launch. Yes, really. It would be an understatement to say the game had a rough launch. With servers getting annihilated by there being more players than expected online. To a small outrage over the pre-order exclusivity of the Jason variation designed by Tom Savini. With accusations made by some players that the Tom Savini designed Jason is a form of Pay-To-Win since the Savini Jason isn’t just a skin but has unique abilities. Plus countless bugs and exploits that are slowly being patched out. But even after listing all of the downsides to the game I can’t help but recommend it. It provides a unique experience and once the developers address the glaring issues it will be a fantastic game. In addition, thanks to the strength of the IP, there is going to be almost a guarantee of a high number of people playing this game for years to come… So long as these issues are fixed. My recommendation to the developers at Illfonic is to try to fix the glaring issues ASAP. If the single player campaign has to be delayed then so be it because these issues are a deal breaker to many. My second request is for them to include Steam Workshop support along with map making tools. A good game but it has some bugs and wonky-ness. 7/10. * Of course, this isn’t the first game where players can play as a Slasher movie villain. The first example of this is the Texas Chainsaw Massacre game for Atari 2600 where players can play as Leatherface. And little did we realize that the developers at Rare had the same idea when they were contracted under LJN to make A Nightmare on Elm Street game for the NES. Rare had the idea to let players play as Freddy Krueger and kill teenagers. However, the idea was squashed early on in development. Most likely because of Nintendo’s strict censorship policy in the North American market at the time. Plus the possibility of a backlash from parent groups. Wow, thanks for the hugely detailed review!!! Nice review. It's a shame about Part 7 Jason. He's my favourite Jason from the movies, visually. The game is on my wishlist and I'm waiting for a sale. Hopefully more bugs will be worked out by them. Interesting. There also used to be a Friday the 13th Commodore game I used to play the heck out of as a kid. You couldn't play as Jason in that one either, but you could kill the other counselors if you were so inclined. There was a Friday the 13th game on the ZX Spectrum in the UK as well circa 1986, pretty notorious as one of the worst games ever. Of course, being a fan of the films I still had to have it. I seem to recall it involved putting crosses in buildings to make sanctuaries for the campers or something like that. 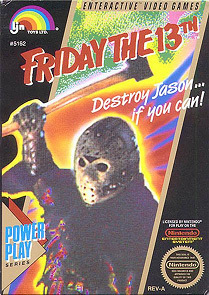 Jason was also impossible to kill on the final level unless there was some really obscure way that I never worked out. Good job I gave up on gaming years ago as I'm sure I'd buy the new game too.